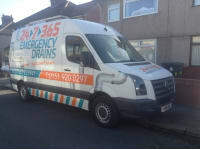 24-7-365 Emergency Drains Services is a well established Drain & Pipe Services company that has built up an enviable reputation. We pride ourselves on our commitment to provide a professional and speedy service at all times, whilst maintaining the highest quality of work. Out within the hour, any time night or day. Over 40 years experience in this trade. Brilliant service! Came out quickly and was very helpful and knowledgeable. Excellent price. Highly recommend this company! Excellent service and so reasonable, would not hesitate to call again. Thank you so much, highly recommended. Excellent, prompt service, drain blockage cleared in a very professional manner and good advice received. Recommend 1st class: Professional, knowledgeable and hassle free. Should have called this guy first. 3rd time lucky - Highly recommend - Beats the rest hands down! with such a fair price too. Pat, thank you for your speedy service and for clearing the external drain at such a reasonable price.